June is National Safety Month. It is important to keep everyone safe, especially when it comes to your aging parents living independently at home. FirstLight Home Care put together a list of home safety tips to help aging parents prevent falls and accidents in their home. Start with the exterior of your parents’ home. Walk around home to check out the condition of sidewalks, handrails, lighting and vegetation or shrubs. Uneven sidewalks, loose handrails, poor lighting and overgrown landscaping could become a trip hazard. Move and put away outdoor furniture, flower pots, and gardening tools that could obstruct their pathway. Secure all points of entry. Inspect all windows and doors for weak or faulty locking mechanisms. Make sure your parents know how to work the locks properly. Warmer weather is approaching, secure window air conditioning units with a metal bracket, sliding window locks or steel corner braces to prevent them from being pushed into or pulled out of the home. Make sure your parents are locking all windows and doors and that they are not leaving a back door unlocked or a window open when they’re not at home, home alone, or at night before they go to bed. Check exterior lighting on their property. The front porch lights should be strong enough to illuminate the entrance and front yard. Other lighting around the exterior – near the garage, backdoor or alley, should also be lit. Motion sensor to exterior lights can be helpful because they don’t require your parents to remember to turn on or off. Move inside and check around the home. This is the place your aging parents will spend the most of their time. It is important to check the ease and accessibility to all rooms in their home. Make sure furniture is not obstructing walkways. Remove throw rugs to avoid tripping. Re-position floor lamps so that they don’t trip on their cords. Purchase nightlights and place them throughout the house in case they get up at night. Clear away all things from the floor – pet toys and bedding, stacks of newspapers or magazines. Make sure stairs have handrails on both sides of the star and that the end of the stairs is clearly marked (top and bottom). Check for smoke and carbon-monoxide detectors are working. Once you have assessed the exterior and interior of the home, fixed or replaced all issues, it’s now time to talk to your parents about home safety. Walk them through the changes that have been made, discuss their needs and concerns about their safety while living independently at their home, and continue to modify and discuss their needs as time goes on. Not sure how to start the conversation? 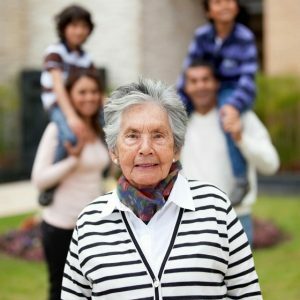 Check out last month’s blog, “Questions to ask your Aging Parents” to help get you started. Join us on Facebook for more safety tips for your home, car, travel, and more.